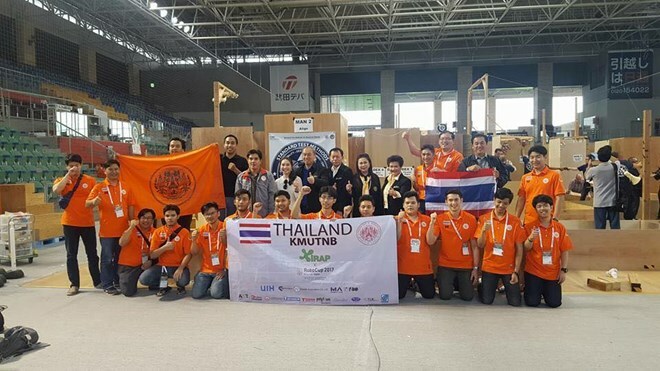 Bangkok (VNA/NNT) - A group of Thai students from King Mongkut's University of Technology North Bangkok (KMUTNB) won two awards at the World Robocup Rescue 2017 in Nagoya, Japan. KMUTNB President Professor Dr. Suchart Siengchin welcomed the students who received the first runner-up award and another prize for their robotic controlling skills. A total of 23 teams from 10 countries around the world competed in the event. The head of the Thai team ‘iRap ROBOT’, Alan Brattler, revealed that although his team was able to outpace other teams in the competition, the robot began to slow down during the last 12 minutes due to battery-related problems. And as a result, students from Iran won the competition. He said his team would learn from the mistake.